I became interested in scrapbooking when I saw a memory scrapbook that my best friend had created for her wedding. Her wedding scrapbook was absolutely gorgeous and after getting a look at it, I started to ask questions. Things like where did she get her supplies? How did she get started scrapbooking? And how could I get started? I was surprised when she told me she purchased many of her scrapbooking supplies at our local dollar store, and that some scrapbooking supplies she actually printed from websites online. She also suggested acid-free paper as well, so that your pages don’t yellow as they age. Well, needless to say, after all that I was hooked! So, if you’re new to scrapbooking — as I was a few years ago — how do you create your first scrapbook page when you’re a total beginner? My first piece of advice is: Don’t go out and buy the store! Scrapbooking can get to be an expensive habit, although it doesn’t have to be. I’d suggest checking out your local dollar store to see if they have supplies first, and then pick up a few basic scrapbooking supplies — like a few blank pages, the adhesive or glue, and a few pieces of pretty patterned and solid paper to start. Then, look online for free scrapbooking fonts and other fun things that you can print out on acid-free paper. This will help to cut down on your costs, in case you decide scrapbooking isn’t for you (perish the thought! ), or that you’re hooked but you don’t have a lot of money to spend on your new hobby. 1. Choose 1 to 3 special photos that you’d like to put on your page. Make sure these are your best photos, and it might also be a good idea to have a few copies made ahead of time in case you make a mistake. If the photo is digital, you might consider purchasing a box of photo paper and printing out a few copies to save on the cost having copies made, as well. 2. 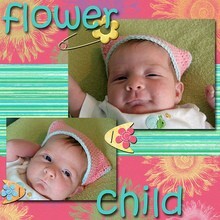 Now, choose the photo that you want to be the focal point of your scrapbook page. You will want to double or triple mat this photo to set it apart from anything else you add to the page. You can do this by using solid paper for the mat, or even colored cardstock. Whether or not you want to use a pair of scissors with a fancy cut pattern around the edges is up to you. Often times what I do is first glue the photo to a piece of acid-free cardstock, then I may glue this to a solid colored sheet of paper that is slightly larger than the photo to give it the first border. Then, if I’m feeling really creative, I’ll do it again to give it a double border. Make sure your colored paper complements the colors in your photograph. 3. 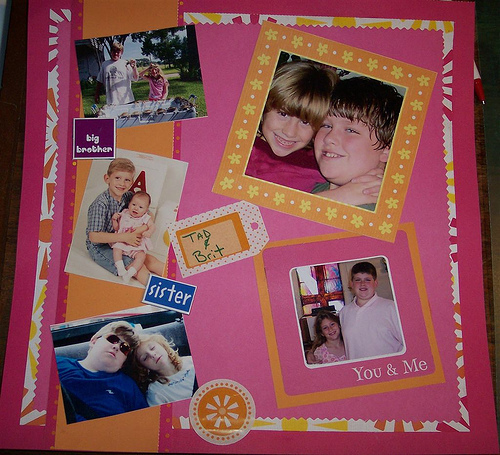 Next, if you will be using other photos on this scrapbook page, make sure that they complement the larger focal point photo, rather than steal attention away from the main photo. To do this, you can trim the photos to make them smaller than the main picture. Also, may want to single mat these photos, rather than double- or triple-mat them. 4. Some scrapbookers swear by a simple technique of putting one smaller bar of patterned paper at the top of your scrapbook page, and then one larger bar of patterned paper at the bottom of the page, as this gives you a visual guideline to know where to place your matted photos. This is a good technique and I’ve used it more than once. I’ve also left the background a solid color before, and used the pattern paper on the mats on the photos, or as a backdrop for a special sticker, or piece of journaling I wanted to add to the page. 5. Speaking of journaling, this is a great thing to add to your scrapbook page as it will preserve your memories of the event — for yourself and future generations. You can write your text on cardstock and then cut it out in a particular shape or with a pretty border and add it to your page. If you don’t like your handwriting or you’re afraid you’ll make a mistake when writing, consider typing out what you want to say in a nice font and then printing it on cardstock. Then, cut out the journaled piece and add it where you like on your scrapbook page. 6. Once you have all your pieces ready to add to your scrapbook page, then you’ll want to first lay them out on the page to see how they look. Move things around until you have them as you like them best. Then, using your acid-free adhesive or glue attach them to your scrapbook page. That’s it! You’ve now completed your first scrapbook page. Wasn’t that fun? If you’re anything like me, I’m sure that once you make that first page, you will be hooked on scrapbooking and will never want to go back to putting photos in regular albums.